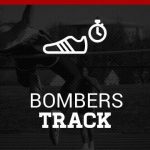 The HS Boys and Girls Track Teams participated in the Twin Lakes Invitational last Friday Night. The teams paired up to win the Combined scoring for the event. Great Job to both teams!